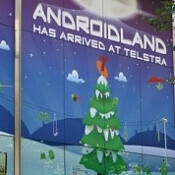 Androidland, the first store dedicated solely to the Android experience, has opened doors in Melbourne, Australia, with the major participation of Australians telecom Telstra and with the backing of Google and major vendors. It’s been in the making since July, but opened for business just recently. The idea behind the store is to showcase and educate. It offers the full experience and even augments it with Gingerbread smells and other neat little touches like a big-screen Angry Birds gaming. Of course, it’s mostly about checking out the latest tablets and smartphones, to have that valuable hands-on experience, which could easen up a transition from another platform or a feature phone for users. The store occupies 154 feet and is planned to be open in the next six months, and it could stay longer if customers accept it warm enough. But probably the most important thing about the store is the human factor with employees ready to explain and help with all things Android. Now, this is just an experimental project and we wouldn’t see it as nothing near the Apple Store level of customer support and retail, but it’s definitely an interesting venture, don’t you think? Why were they using a joystick to control the Google earth experience? How 1984..... touch screens people... virtual keyboards..... holographic responses...... the people have spoken, hence the design popularity of phones, tablets ad apps.... who aret these tards implementing "joysticks"? It would be great if there was something like this in Germany. Yeah, great move Giggle, awsome! Apple made iOS, Giggle copied it. Apple made AppStore, Giggle copied again, Apple made Apple Stores(Shops) and guess what? Giggle made the same...Shame on you, Giggle! Yeah and everyone who made cars was copying the Model T. Get over yourself. you mean.. there wasnt any tech stores before apple?!?!? wow.. how ever did we get electronics??? Dude, there was no such thing as electronics before Apple. Do your homework. I was joking :-) Most of what I say is sarcasm, except when it makes perfect sense... then I did it on purpose. Sorry who is this giigle you talk about? who is striker and what is giggle? That sounds really neat, hope it works out, would love to see one in the states. Another reason I want to go to Australia.